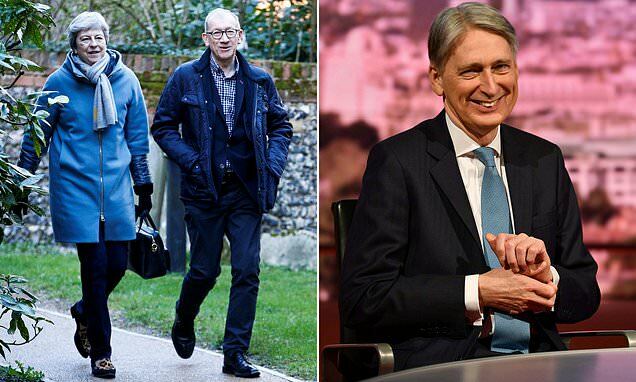 Philip Hammond has urged rebel Tory MPs to 'get a grip' and back Theresa May's Brexit deal next week or risk never leaving the EU. Responding to a question about four Cabinet ministers ignoring a three-line whip and abstaining on Wednesday's vote to rule out no deal Brexit, he told the BBC's Andrew Marr Show: 'I think a line has been drawn under that now. Mrs May angrily criticised David Gauke, Amber Rudd, Greg Clark and David Mundell for not backing the government on the no deal vote at a Cabinet meeting on Thursday. Cabinet ministers would normally be expected to resign for defying a three-line whip, the strongest one possible, and their decision to remain in their posts angered Brexiteers . On Marr, Mr Hammond appeared to reject reports he had discussed abstaining on Tuesday's vote, saying 'I don't think so'. Earlier today, Mrs May begged MPs to act like 'patriots' and vote for her Brexit deal if it makes a third showing on Tuesday or Wednesday - as it emerged the EU is 'war-gaming' for the fall of her government. Mr Hammond told Marr a vote on Brexit would 'not definitely' happen - as he refused three times to rule out whether he had offered more money to the DUP to back Theresa May's deal.